David Lebovitz is a master dessert artisan. I know, I know.. Where have I been?? Make no mistake, I've known of David Lebovitz, but I hadn't previously made any of his recipes. As usual, I have no idea what I was waiting for, but I'm happy to have finally come around. And just in time for V-day, I'm falling in love with his recipes, one at a time. Let's start with his Goat Cheese Souffles. So how did I happen upon this recipe and decide to make it? Well, my friend Elizabeth McNair who, btw, has been a fan of his for quite some time, mentioned she had scored a ticket to see him live and in person at a demo he was doing in Dallas, Texas at Central Market. I was thrilled for her to get to go, but little did I know how thrilled I would be for me.. THANK YOU E for sending me this recipe. It's to die for. It's light and airy but with a lightly creamy soft lemony center. David says in his post that you can make it as sweet as you like by adding more sugar to the base. Instead I opted to add extra sugar to the inside of my souffle dishes as well as extra on top. The result was nothing short of Heavenly. I used Native's Crystal Organic Sugar that I picked up at Whole Foods and the larger crystals worked perfectly for these souffles. 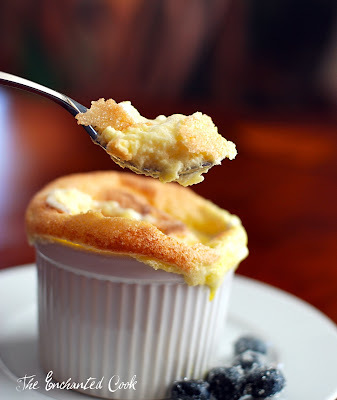 He also mentions that you can drizzle a little fresh-squeezed lemon juice atop the souffles before placing in the oven to give them an extra lemony zing. I will try this next time I make them, but the flavor was nothing short of amazing even without doing so. Also, David's recipe calls for 4 4-ounce souffle dishes but since I only had 8-ounce souffle dishes, I made 2 larger desserts. I actually had leftover batter, too. one out? They make zesting so much easier than any other zester I've used. Generously butter and sugar the insides of your souffle dishes and set aside. 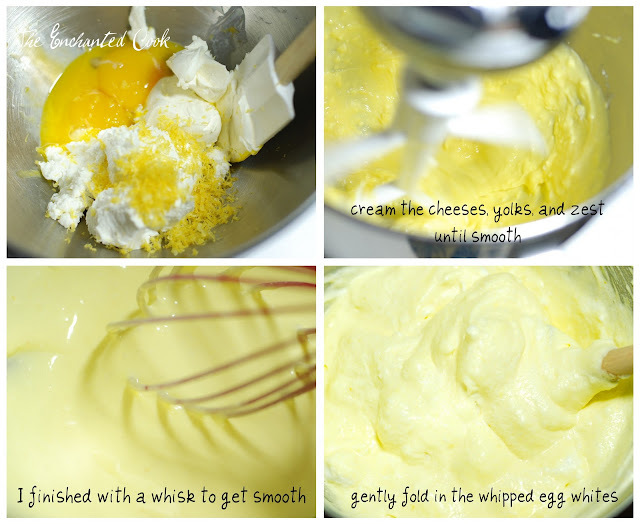 Using a stand mixer fitted with the paddle attachment (or you may whisk by hand), place the cream cheese, egg yolks, goat cheese, and lemon zest in the bowl and mix until creamy. Set aside. Next, using an electric hand mixer or a stand mixer fitted with the whisk attachment, place the egg whites and salt in a glass or metal bowl and beat until frothy. Increase the speed on the mixer and continue mixing until they begin to hold their shape. While beating, gradually add in the sugar, one tablespoon at a time and beat until stiff. Using a spatula, gently fold the egg whites into the goat cheese mixture. Do not over fold. It's okay to have some white bits showing. Scoop the mixture into the the prepared souffle dishes to just below the top of the dishes and gently smooth the tops. Don't overfill, or your batter will spill over when baking. Sprinkle the tops with sugar (I did this liberally and it was yummy). Place filled dishes on a baking sheet and place in oven in center of middle rack. but they were still fantastic. Bake 10 - 15 minutes or until the tops are lightly browned and the center still feels a little jiggly when gently moving from side to side. Serve fresh from the oven with fresh blueberries or raspberries on the side if desired. The souffles should be soft and slightly runny in the center. I can't wait to make these again for Valentine's Day! 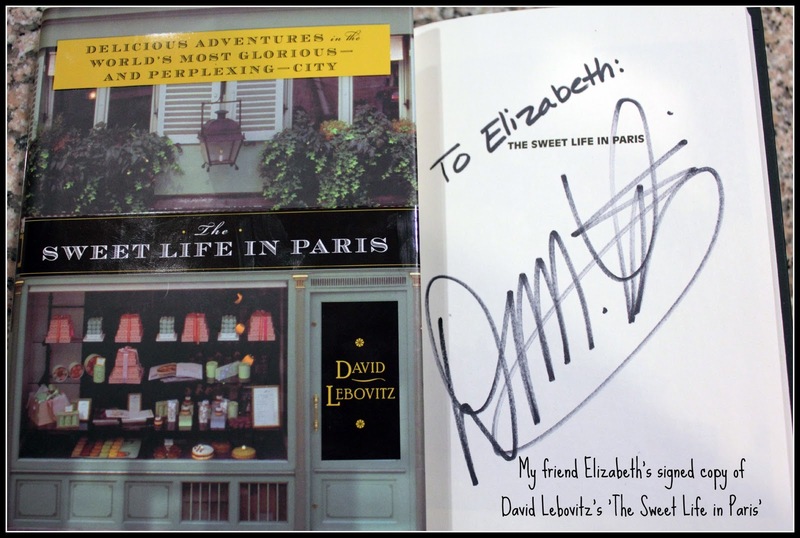 Do you have a favorite David Lebovitz recipe? It's easy and versatile - just use whatever fresh veggies and herbs you have on hand, or whatever your favorites are. This morning I had tomatillos on hand, so I diced and threw some in...Um, hello! Why haven't I done this before?? You just peel back and remove the outer paper-thin husk and then rinse the tomatillo, as they are a little sticky. The tomatillo resembles a small green tomato and tastes very citrusy. You may eat them raw, cooked, roasted - any way you like. Heat a skillet over medium heat and melt butter. Then add the diced potatoes and allow to cook for a couple of minutes. Next add the rest of the veggies and saute until they are tender. Since everything is diced small this should go quickly. Remove from pan and set aside. Using the same skillet but over low heat, melt the butter. Meanwhile beat the eggs and cream then pour into the skillet. Stir occasionally until cooked but moist and soft. Add salt and pepper to taste. While the eggs are cooking, heat up your tortillas. I like to gently toast them in a pan or on the actual burner, just be careful not to burn yourself when flipping. Place one tortilla in the middle of a plate and top with a small bit of the cheeses. Then put half the scrambled eggs on top. Next put half the veggie mixture on top. Lastly sprinkle with a little more cheese and garnish with cilantro and jalapeno. Repeat with other taco. Fold and eat. The tacos will be overflowing, so grab a fork to gather every last bit! Ahhhh...a little plate of sunshine if ever I saw one. 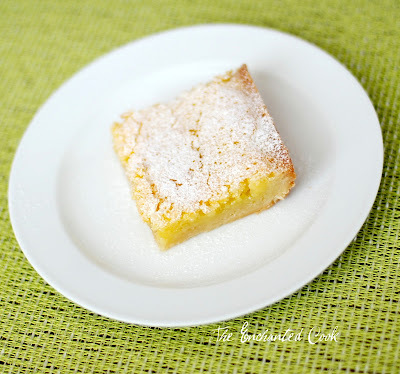 I just love lemon bars. There's something ethereal about them. Fresh, lemony goodness on a perfectly baked shortbread crust with a gentle dusting of powdered sugar on top.. like fresh fallen snow. As the winter comes on strong, why not bake your own little plate of sunshine - a sweet reminder that spring is just around the corner. 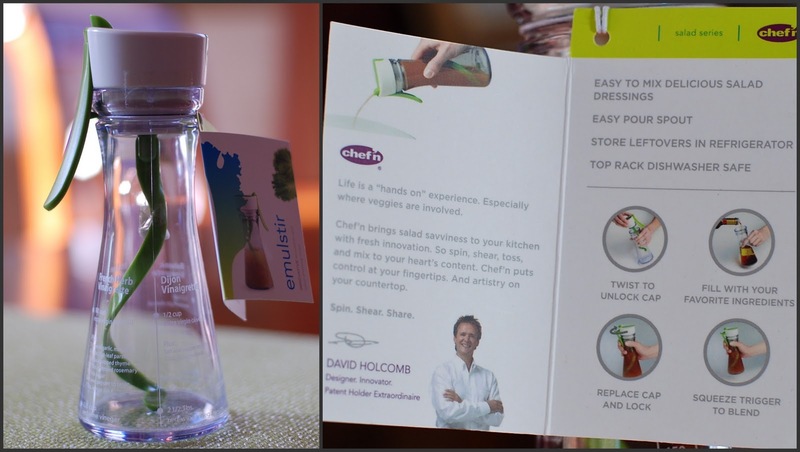 Please check out my guest post on Chef Dennis' blog - More Than a Mount Full - where I share the recipe, the inspiration, and step-by-step photos. 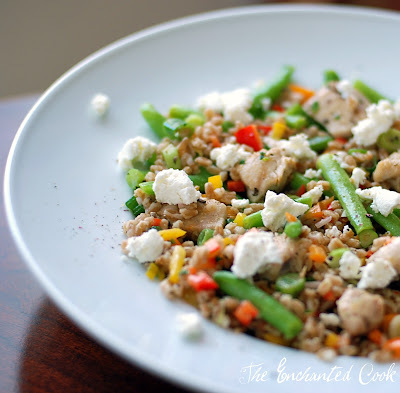 Hearty, healthy, easy AND delicious. This was so quick and easy I whipped it up for a quick lunch this weekend. As is often the case, I headed out to the market - this time Whole Foods - to pick up some specific items and ended up strolling around the store and getting super hungry. Lots of delicious flavor and not too spicy at all - just perfect! 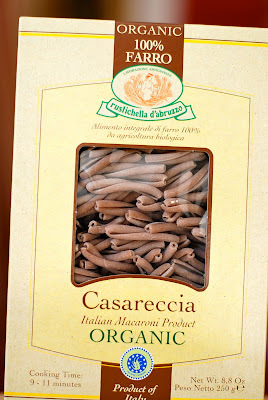 And I immediately thought it would go great (and would be quick) in a pasta dish, so I headed to look for some fresh rigatoni pasta. 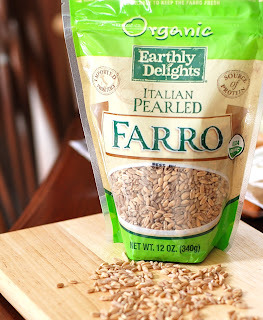 I didn't find that so I wandered into the dry pasta area and discovered pasta made with farro! So healthy and hearty. And since you'll have the pasta cooking while your pulling your sauce together, dinner (or lunch in this case) will be ready in under 30 minutes...easily under 30 minutes. Heat a skillet to medium and add olive oil, then brown the slices of chicken sausage. It's already fully cooked, so you are just browning here. Meanwhile, cook the pasta according to package directions using heavily salted water. This will help give a little more flavor to the pasta. Next add the tomatoes, roasted red pepper, and a heavy pinch of salt, and stir using your spoon to break up the whole tomatoes into smaller chunks. Saute over medium heat, stirring occasionally and allowing the liquids to cook away, about 10 minutes or so. Taste and, if desired, add more salt and crushed red pepper to taste. When pasta is ready, drain and place in large pasta bowl. Drizzle a little extra-virgin olive oil and sprinkle shredded or grated Parmigiano Reggiano over the pasta, then cover with sauce. Garnish with more Parmigiano Reggiano and fresh basil. 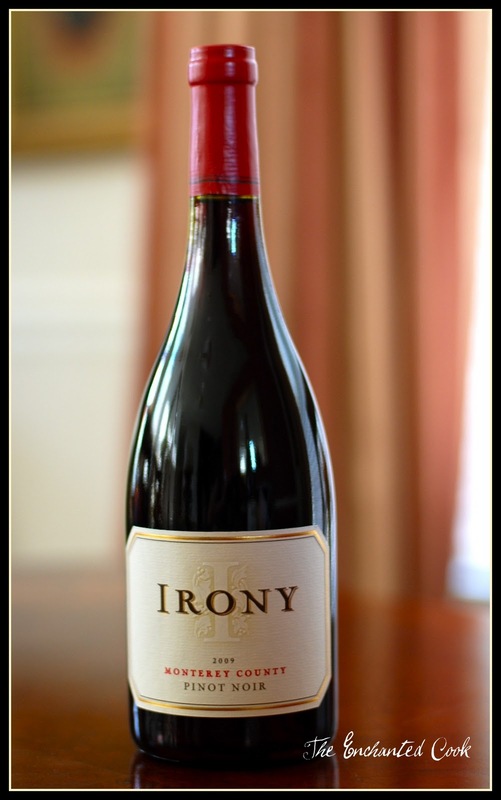 Excellent served with garlic bread. Welcome to a big bowl of hearty and delicious! 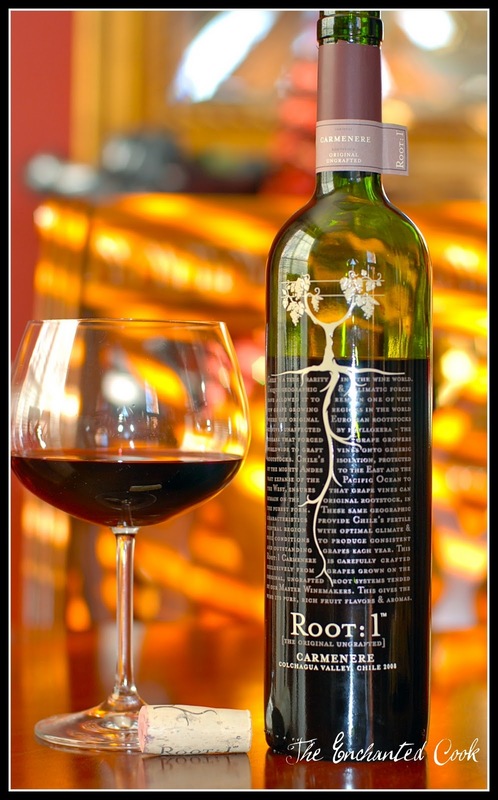 This bold red from Chile is fabulous and well-balanced with gentle notes of blackberry, plum and spice. Think Bordeaux. I would enjoy this anytime but it was excellent paired with this spicy pasta. Root: 1 uses grapes grown from their original, ungrafted root systems. The result is pure and delicious. 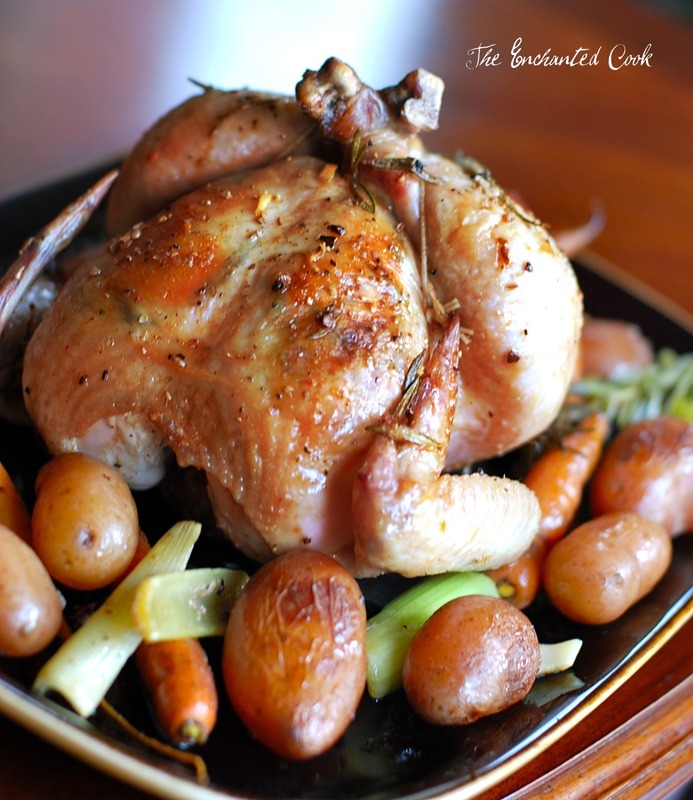 Whole roasted chicken is so easy to make I don't know why I don't make it more often. I mean, this is a perfect Sunday afternoon meal. Throw some veggies in the bottom of a dutch oven, drizzle them with a little white balsamic vinegar and white wine, season the chicken and stuff it with lemon and herbs, then put it on top of the veggies and you're ready to roast. Place carrots, potatoes, celery, 3 cloves of garlic, and 2 stems of rosemary in the bottom of a large 7-quart dutch oven or roasting pan. Drizzle with balsamic vinegar and wine. Season with salt and pepper. notes of apple and pear. Remove giblets from inside chicken, if included, and discard. Wash chicken and pat dry with paper towels. Season inside of chicken with salt and pepper. Place both halves of lemon, 2 cloves of garlic, and 1 stem of rosemary inside the cavity of the chicken. In small dish mix together softened butter, minced garlic, rosemary leaves from 1 stem, 1 teaspoon kosher salt, and 1 teaspoon fresh cracked pepper. Place some of the butter mixture under the skin of the breast and rub the rest all over the chicken. Using kitchen twine, tie the drumsticks together and tuck the wing tips under. Then place the chicken on top of the vegetables. Place in oven and roast uncovered for 60-90 minutes until meat thermometer inserted into thickest part of the breast registers 165 degrees and juices run clear. If chicken starts to get too brown, place the cover on the pan. Remove from oven, place cover on pan and allow to rest for about 10 minutes before serving. This California Pinot is beautifully smooth and very light with traces of cherry, toasted vanilla, and earthy undertones. 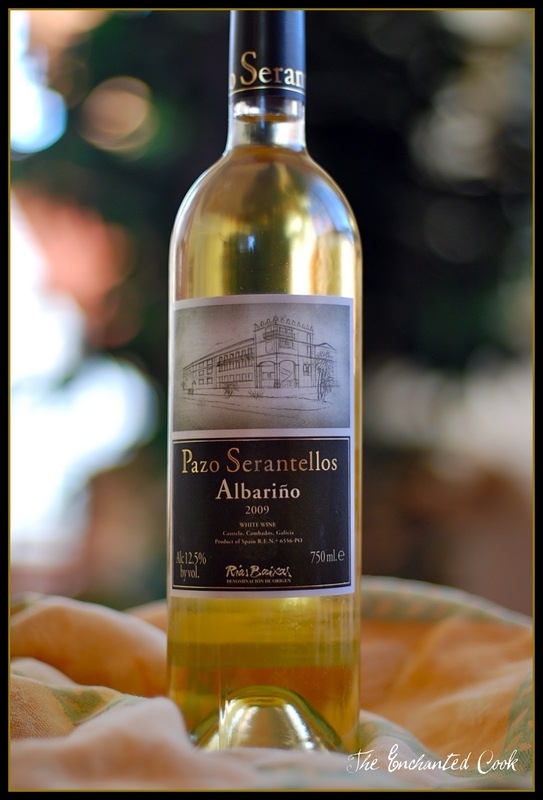 Paired with this roasted chicken, it's a nice departure from the obvious Chardonnay. What better way to celebrate something special than with a healthy, flavorful dish like this Spicy Seared Ahi Tuna Salad with Sesame Ginger Dressing? This dish was inspired by a seared tuna salad I recently enjoyed with my friend Michelle Patterson at a lovely restaurant called Artin's located at The Shops at Legacy in Plano, Texas. Artin's has an upscale yet warm and inviting atmosphere and elegant, creative menu. If you happen to be in Plano, make plans to have a meal at Artin's - lunch or dinner - you can't go wrong. Whisk all the dressing/dipping sauce ingredients together until emulsified and well blended. Sprinkle both sides of the tuna steak with kosher salt. In small bowl mix the black and regular sesame seeds and crushed red pepper together. 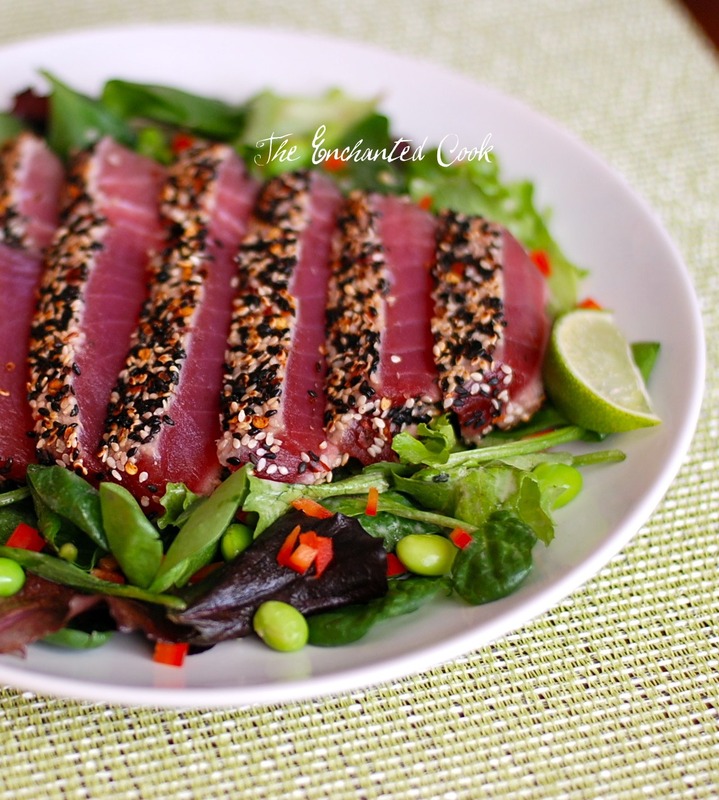 Using your hands, coat both sides of the tuna with the sesame seed mixture. Pat and press to be sure it's well coated. Heat non-stick skillet to high and add canola oil to coat bottom of pan. Skillet should be extremely hot, then place sesame-coated tuna in pan and allow to sear for 45 seconds then flip and sear another 45 seconds. Mix ingredients for salad (mixed greens, edamame, bell pepper) together and toss with a small amount of dressing. Arrange on plates and top with the sliced tuna. Serve with extra dressing on the side to dip your tuna in. I also like to drizzle fresh squeezed lime juice on my salad but be careful not to do this until just as you are eating or the tuna will begin to turn white from the acid of the lime juice. It won't hurt anything if it turns white, it's purely an aesthetic thing. This Spanish Albarino is crisp, light and a little on the dry side, but with a hint of citrus. It pairs nicely with the spicy fresh tuna.